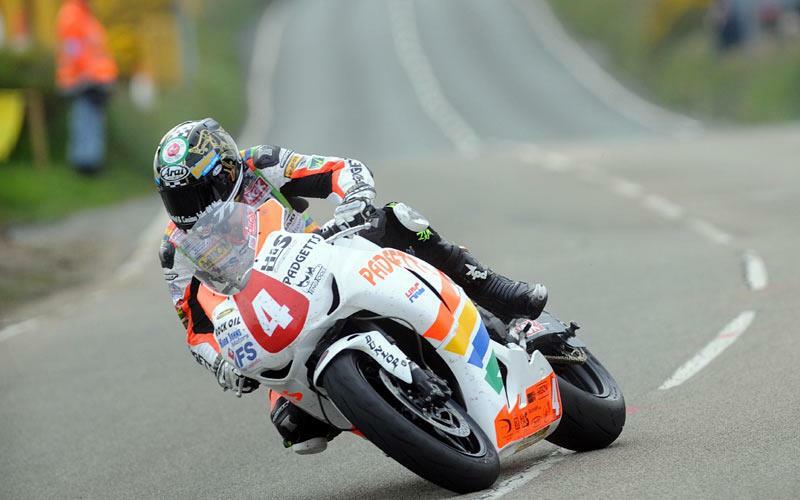 Ian Hutchinson tops practice week with a 130.614mph. John McGuinness does 130.242mph on Wednesday but is robbed of a Friday night run by a curious HM Plant Honda decision to not let him ride because his bike is all set to go and there is nothing new to test. Whatever the real reasons behind that call, apart from these two, we’ve not seen the really blistering laps that we might have expected. Okay Hutchy is inside john’s Superbike lap record of 130.442 but has not touched his Senior TT and outright lap record set last year of 131.578mph. In fact Hutchy was 7.62s shy of equalling it. And their rivals are ‘only’ clocking 129s. Only being a relative term, because let’s fast it, anything over 125mph around the TT course is still bloody fast. But the weather’s been tops. The bikes have had a winter’s development. Tyres have been improved and while some Dunlops seemed to chew a bit to easily early in the week the fresh batches flown in for tonight’s session seem to have worked well. So why is it that we’ve not seen the record touched? The Relentless by TAS duo, Cameron Donald and Bruce Anstey both clocked 128 laps tonight but I still get the feeling they’re not 100% happy with their bikes. Keith Amor is in there among the 128s and, unlike some who you might think are already at their limit, I’m sure Keith’s got more in him come race time. The rider no one has really been talking about is Adrian Archibald. He did 129.360 tonight on his Suzuki and I can see him having a nice consistent ride like he always does and ending up biting the arse of the some of the more fancied runners. But then again maybe McGuinness has it right and everyone is playing mind games. I’ve got another more simplistic theory after watching the teams all week and ear-wigging the conversations. The top guns reached a point mid-week where they mind of found a base setting to run 128s and then tried to eke out a bit more by stretching the setting a bit more - but to the point where things start to be less favourable. Then they backed off a click and will be ready to race. So maybe Cummins is right. Practice is for setting the bike up and race time is for letting rip with the 131 and 132mph laps. Given the weather, I reckon that’s what we’ll see - record books ripped to shreds. But it might not be just the usual suspects doing the damage. Suffice to say I’m glad I’m not a gambling man because there’s no way I’d like to lay odds on who the favourite is right now. Isn’t that just fantastic? Nice little story I heard over coffee with one of the team’s today. It seems there was a clause added into the rider entry forms this year that said something to the effect that the top 15 riders would have to carry ballast at this year’s TT, if they didn’t carry a TV camera. That ballast is a couple of kilos. Thing is, because the riders signed the form – probably in most cases without reading the fine print - they missed that gem. So when the team I was chatting with went to scrutineering on Wednesday (bear in mind they’ve already been on track two days by now) the first thing they hear of this new rule is that they get presented with a block of plastic, it even comes with a mock ariel, to strap onto their bikes with Velcro. Now I know this is common practice in MotoGP (to ballast the bikes) but that’s all pre-planned. So is it wise practice for the TT – a place with even the best bikes sometimes end up with bits coming loose through vibration or even fracturing. What if one came off and causes an accident? Whose fault is that? And why only the top 15 bikes come under this regulation. Why not top 20? Surely it should be the entire field? Or better still scrap such pettiness. The question is, who’s idea was this in the first place? The team I talked to had a conspiracy theory since cameras are by choice and only certain teams get that choice to run them. Obviously they don’t want to turn down the PR benefit. But could they really be worried about a trifling minimal weight handicap when they already (theoretically anyway) have the fastest bikes and best riders in the race?